A new version of Teekesselchen is available. Please go to the Download page. This tab allows you to select the meta-data fields and to define the exclusion criteria. Teekesselchen uses the selection to determine duplicates. Sometimes this plug-in marks photos as duplicates which are none, e.g. photos from a continuous shooting with an equal timestamp. In this case you should define a keyword for photos which Teekesselchen has to ignore. Add this keyword to the specific photos and remove the keyword for duplicates. These photos will never be marked as duplicates again. This section offers the selection of meta-data about the camera, settings during the image acquisition, global positioning system (GPS) and the capture time. Teekesselchen takes the selected meta-data fields and marks photos with equal values as duplicates. Usually it is a good idea to select all fields but you can reduce the processing time by using less meta-data fields. An empty meta-data field will always be ignored. The capture date is always on and cannot be deactivated. 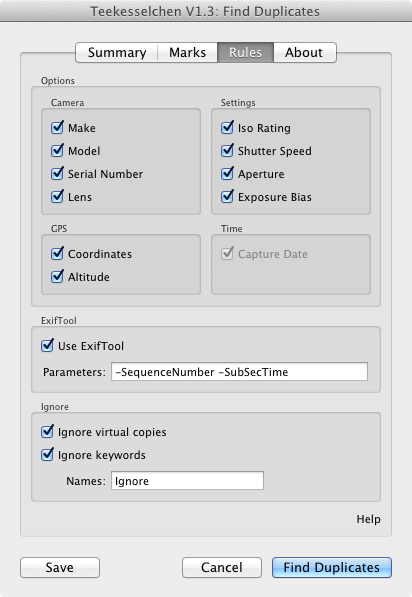 ExifTool is a programm written by Phil Harvey which, extracts Exif metadata from photos. Teekesselchen can use this application to get more information, e.g. the sequence number or the sub-second. This can be very helpful for continuous shootings. Lightroom supports only seconds as smallest unit leading to unmeant duplicates if you take more than one photo per second. If you turn on this option then Teekesslechen uses the ExifTool only for potential duplicates. The execution is pretty expensive (in terms of execution time) and can slow down the duplicate finding process. Another challenge are the different metadata fields. Nikon's raw format supports the sub-second but not the sequence number. Panasonic's format doesn't know sub-seconds but provides the sequence number. Thus, it is not guaranteed that ExifTool can help you with your specific format. Please take a look at the ExifTool documentation and share any useful tags with us. You can use the commenting function at the bottom for this. Not all photos should be taken into account during the search for duplicates. In order to make the selection of photos still comfortable you can define criteria when photos should be ignored. The first option are the so called virtual copies. They are referencing a master photo and have usually the same meta-data. Thus, virtual copies are usually detected as duplicates. Select this check-box to avoid the inclusion of virtual copies. You can also mark photos with a keyword to exclude them from the search for duplicates. The field "Names" is a comma-separated list of keywords. All photos with one or more of the passed keywords will be ignored.